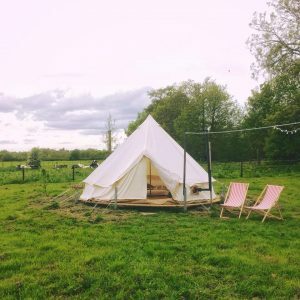 The glamping site is located on an oxbow lake in a tranquil location away from the farm and dairy buildings. The Manor Farm pub is conveniently located on the farm site and serve very affordable meals all day – we highly recommend the English breakfast! Any history enthusiasts may also be interested to know the farm was a key site in the civil war with both the first and last battles of the war being fought on the land in 1642 and 1651. 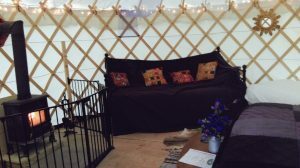 We have two separate glamping sites, one with 5 yurts and one with 5 bell tents. Each site has its own shower and toilet block and basic kitchen area with a sink, fridge and tea making facilities. The two sites are far enough apart to allow for two different groups enjoying each one undisturbed, but close enough together so that a large group can enjoy both sites together. 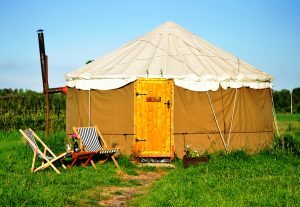 Our yurts and bell tents are furnished and based on wooden floors. The yurts have log burners and the bell tents have small wood burning stoves. They all enjoy electricity and fairy lights, and the shower blocks are in close proximity (the furthest unit is no more than 80m away from its shower block). We supply all bedding, but please bring your own towels. Please be advised that you need to be self sufficient for all your catering needs. Various takeaways deliver to our site and we can recommend a number of local eateries, or the City of Worcester is less than a £10 taxi ride away.